When the car is decent then it's a matter of dialing it in for the different tracks while developing the car further. Ironic that it'd be the right time to have a top driver joining the team. We called the last year's car decent too and then it all went down in flames after Spain. I am gonna wait till half of the season is done before I pass the judgement. Mclaren said in their post race report that they managed to obtain crucial data about how the car performs on this type of track, a front limited one with long slow snail corners like the turn 1 to turn 3 complex and fast long corners like turn 7 and turn 8. All this data will enable them to fine tune both mechanical and aerodynamic upgrades in the pipeline. The biggest strength of this car is that it is predictable and easy to setup. It has no nasty surprises. Drivers feel confident. Also this car has good traction and is composed under braking. Finally it is slippery on the straights. As with every team downforce is the holy grail. Now it is about adding as much efficient downforce as they can. Also i expect a different rear wing at Barcelona and who knows a modified front wing as well. They will develop this car right till the end of the season as next year's car will be an evolution of the current one. I see Mclaren and Renault to start pulling away slowly from the rest of the midfield Barcelona onwards. Mclaren are not scratching around trying to fix issues with this car instead they are focused on adding performance which is a big change from last year. Baku most likely will be a decent track. The works Renault team is currently quicker in slow corners but the McLaren is faster on the straights. If Mclaren can find some performance in slow corners with mechanical tweaks the car will be an excellent arounder. Oh cmon. I can see exactly similar posts from 2017 and 2018.. And then it all went to ****. Let's wait and see. Edited by MrRat, 18 April 2019 - 01:29. Well I think it’s safe to say this years car is far better than last years already. Mclaren did alright in Melbourne last year, but in the following races the pure performance and pace was far worse than what we’ve witnessed this year. A fair share of the improvement this year may be down the the Renault PU though, so a bit of caution may be issued as to where chassis development may lead this year. That's why I am going to wait till 2nd half of the season before passing the judgment. Been hearing that McLaren(and Honda back then) now just have to upgrades and they will start pulling away from the midfield. Let's see where they stand as of now, with uck they would be clear 4th but imo, McLaren needs someone like Alonso right now. No offense to Sainz and Lando, they are good drivers but they don't have it in them to replicate what Nando can and he would certainly be clear best of any midfield in this car like he was in the initial phases of last year. Well IMHO, you do not need top wait for the 2nd half of the season to sew how this year's car is. The last year there was a lot of talk already that 33 had it tail jumping around and was bit of a trouble. Talks aside, the bargeboard we did not see and the car remained visibly bare almost entire season, obviously the team knew the issue were large. Rumors are one thing, but seeing the actual car developments and the amount of details we see on the car is the prove that the team knows the base is 'decent'. Fair enough. Lets not forget however, that last year Alonso was driving the car. Results looked better because of his skills. Even Vandoorne profited IMO more from Alonso's expertise, than Norris does from Sainz's. We had updates to car at Bahrain, Spain. Major ones and those updates were going to catapult the car to the front of the grid. It never came. Let's wait and see. It is important for the team that the pace Lando has shown in the races will be achieved by two cars, starting from the next race. This will show that McLaren is working towards the right direction. I was afraid of the Mercedes in testing (sandbagging) and the result by the first 3 races gave me a clear picture of the big gap that is still there .I am not buying that the Ferrari engine is better than the Mercedes PU.They downplay their card like always...they have more in the bag that anyone is thinking. I think with a little bit more luck Mclaren would have been a little bit faster than Renault.The race pace is very good .I think Sainz is still a little bit faster than Norris.He is more consistent ,but things can change during the year.Norris is clearly a better driver than i thought.good for him. He was handed a penalty, though. Which is completely against their supposed policy. Penalties mostly seem to depend on if you are on the protected list frankly. There is a massive difference between 2018 and 2019 cars, where the car has looked competitive on all three tracks so far. 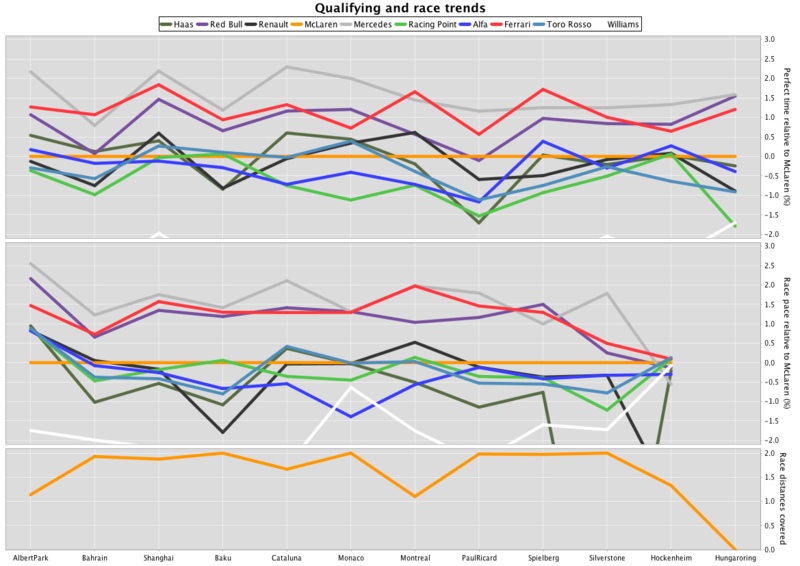 Australia both cars would have qualified in top 10 and scored points, Bahrain both cars in Q3 and Sainz could have finished ahead of both Redbulls and in China all evidence points to McLaren having 4th best race pace. 2018 car was a dog on the straights, unresponsive to setup changes while 2019 car ia slippery on straights and responds to setup changes. Last year Mclaren themselves did not realize the root cause till after summer break. This year they have already started bringing proper upgrades and they are delivering on track. Newey himself has said Mclaren have built a good car this season. 2019 is not about blind optimism, there is enough evidence available to see especially in terms of the lap time improvements both over lap and in race conditions despite the new regulations it is crystal clear 2019 will not be a repeat of 2018. Is a stupid policy that let's drivers get away with bad driving. Incidents should be investigated, and if required, punished, regardless of what lap they occur on. EHhhhh. The 2018 car being dog on the straights and unresponsive to setup changes came out a few months into the season. It's all in hindsight. Before that we were saying the exact same thing in March, April, May that we are today ie they just need to build on the base. We also said andthat once they get more experience with renault PU they will make good gains. I can go back and copy paste the comments and they will be identical to what's being said. While 2019 might not end up being a repeat of 2018, I am still not sure they will be able to clear the midfield. Basically the point is I am cautiously optimistic. Remember, updates were brought in Bahrain (bigger updates) and Spain as well last year. Edited by MrRat, 18 April 2019 - 19:56. I am also cautiously optimistic about McLaren. Team seems in balance. The problem is, a lot of teams have points of optimism. What if Haas can get their Q speed towards races, what if the reliability is going to cost to much points? Alfa seems stable, Racing point fights on it's own for points, same counts for STR. The prediction of tied midfield has came to reality until now imo. And by that, most can still general rightfully fight for p4/5 WCC. It's going to be a great battle imo. For the drivers also, who will be 7th in WDC is for sure a thing. Some will lose image if low in the ranking and some can increase by surprise high ranking. If McLaren beats Renault, for sure Sainz and Norris would be valued higher than at start season and for Renault drivers would count Visa versa. For that, only those drivers have really what to lose in that aspect imo. A common issue with "expectations" (particularly in the media) is giving far too much weight to recent events. So... McLaren had an usual and also major aero issue in 2018. Is it normal for McLaren to experience such issues? No. Is it normal for teams in general to experience such issues? No. In which case, assuming that the same thing will happen again in 2019 is not reasonable given that McLaren clearly put in a lot of effort to understand the root cause. There is nothing I can see that that suggests there's similar underlying problems this year. Instead of worrying about a "repeat of 2018" I think it's far more rational to worry about more normal things. Eg, will the upgrades work as expected (something all teams struggle with to various degrees)? Will the upgrades be on time? Will the upgrades be enough? (ie it's not just what we do but what other teams do). Will the pace/frequency of upgrades be enough? Will the upgrades have unintended consequences? For example, there's some suggestions that tyre temperature management is trickier this year, particularly in quali, so if a particular upgrade makes tyre management harder then that would be a problem. I suspect that once we come to Canada and the races in Europe afterwards that the year-on-year improvements will start to shoot up quite nicely. Although as a lewis fan i dont follow mclatwn as much anymore its great to see them start to turn around this year. I hope renault can deliever for them and wee see them rise to be a contender again. It was quite a bit of work but I finally got around to importing some missing data so I could generate certain charts again. Interesting. What is the calculation you are using for race pace? It's very simple - it's the average lap time for all laps except those affected by unusual events such as SC or VSC. Also, I typically ignore the first lap or two - essentially waiting for the natural field spread to kick in. So in the case of China, this is all laps except the first 2 or 3 I think. On a per team basis, it's the speed of the highest classified driver. I might change this so I calculate race pace for all drivers and use the best value per team. 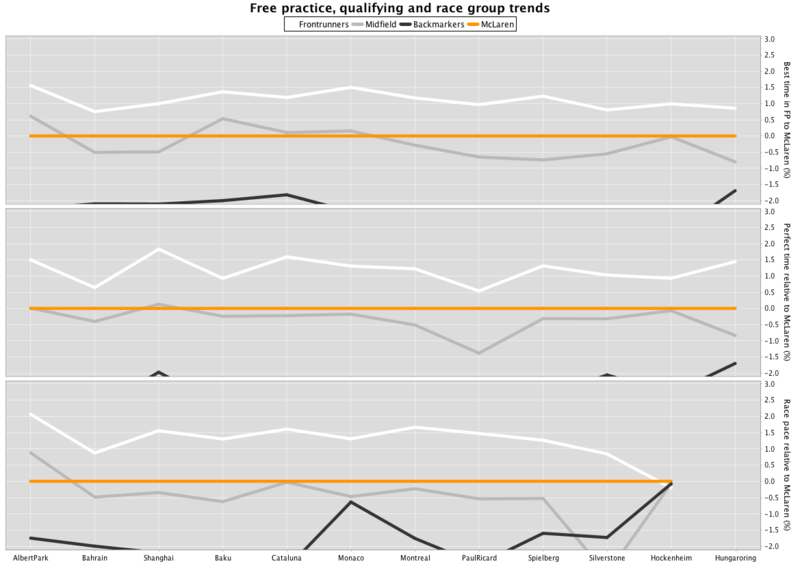 It's interesting how much closer race pace is for the "midfield" this year compared to the end of last year. Also, it's early days and the data is noisy but it seems our improvement in race pace is bigger than our improvement in quali pace. And if you don't subscribe to Autosport Plus you should. It's good. The general tone of the headline feels familiar certainly. It does, doesn’t it, Owen. But Codling does make some good points and includes quotes from Norris. Codling also notes the obsolescence of the Woking windtunnel. I’ve pondered for years how they got themselves into such a situation. £300 million it cost and they moved in 16 years ago. Makes me wonder about how Ronzo and the board decided on their priorities. The MTC tunnel is too small. They use the ex-Toyota, Cologne wind tunnel for F1. I seem to remember the MTC one is rarely used and only for automotive. I think there are (or was) plans to build a new one in the area next to the MTC, right? I can't say I have any faith in the current writers at Autosport to say anything worth paying for. At best they only seem interested in damning McLaren with faint praise or using strawman arguments. They seem to take the attitude that anything other than being a championship contender is a failure - this is true in a sense but that's an awfully narrow view to analyse the team from. Nobody at McLaren is saying that the job is done. It isn't. And isn't going to be done anytime soon. To be blunt, we're still not as competitive as I was hoping us to be at the start of last year, before all the problems began. But that's also why I know we need to be patient - having lost pretty much a year of aero development isn't going to be fixed overnight. But there is clear progress. Surely that can be acknowledged? Of course, we'll want to see even more - we need to see the team start to pull away from the midfield pack. But that's not going to happen overnight either. With windtunnel hours reduced it became a low priority when you can purchase time at a good facility. It would be a big outlay to make when hours could be further reduced at the FIA's whim, - unless you make use for other projects. I believe there is an issue with getting planning permission for any material changes on the site. From the beginning, the local authority have been super-strict about what McLaren do there, notwithstanding its importance to the local economy. After this article I wonder if I shoudn't bet 10 bucks on a Mclaren podium. As well as renting out the tunnel to outside entities. An article is not something that you should base your bet on. The teams would no read any article to prepare their race strategy, now anymore. Perhaps it was a part of the game long time a go. Any article at this very moment, in the current mode of formula 1, is post-event description and not an game changing theory. if it were not a journal. ThIs said, I am looking forward to the result that McLaren will achieve this weekend.